Over the years, I’ve had the great good fortune to visit Annapolis with some frequency. Those who know of my love of history won’t find this surprising, but it was actually love of family that was the bigger draw for me here. My mom’s cousins lived in a wonderful, old 1850s farmhouse–not only on the historic register, but also right on the water. The house had great character, but the setting was the stunner. A sprawling 6 acres rolled over hills and down to a splendid cove. My cousins were great gardeners (of both flowers and food)–and raised three daughters who were/are also gifted and dedicated gardeners. So fresh flowers, inside and out, where always abundant, and autumn inevitably brought a flurry of canning activities, as the wealth of the vegetable garden got preserved for the coming winter. One cousin, Graham, was an amazingly handy fellow (as well as being a brilliant physicist). He loved building things, and he built decks and patios, stairs down to the water, a pier. And then he decided to renovate the 1850s barn, which he figured actually had a better position, in relation to the water, than even the main house. By the time their second daughter was married and had a few children, he and his wife moved to the now fabulously expanded barn, and left the house to daughter and family. Graham added a wing to the barn, and they converted the main barn to a Bed and Breakfast — as it seemed such a pity to not be sharing all this beauty with others. That B&B — the Barn at Howard’s Cove — was a huge success. The glorious setting, beautiful amenities, sensational breakfasts, and warm hospitality winning it many friends. When daughter 2 found herself an empty-nester, she took a cue from mom and dad, and the Farmhouse was soon converted into an equally glorious B&B — The Farmhouse. Most recently, youngest daughter Wendy, also empty of nest, decided this concept suited her skill-set and lifestyle as well. Wendy is a talented artist but also a great cook and entertainer and avid gardener. So her home on a meadow adjacent to the Farmhouse, is the most recent addition to the group of B&Bs here. As they get more and more popular, it gets increasingly difficult to plan visits — and none can be without advanced notice — but I’m delighted that others get to share what I have so long enjoyed — the splendid serenity of the setting and the warm hospitality of this remarkable family. For more info on Wendy’s place, you can check out her new website for Meadow Gardens B&B. This is one of those places that can inspire you to write poetry. But even if you don’t versify, the place’s peace and serenity will certainly soothe you. 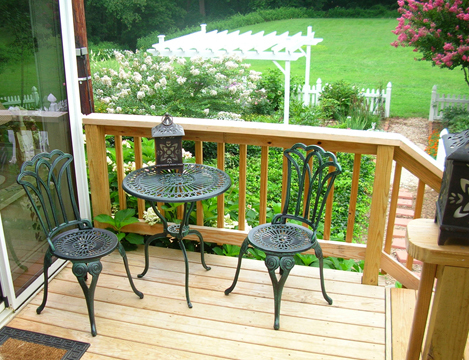 This is a lovely retreat just minutes from downtown Annapolis, cut off from the noise and traffic of the city. I’d want to visit again even if my cousins all left.